People often think of anti-fatigue mats as being designed primarily for safety. Those we carry provide the ultimate in safety and comfort for employees who spend a lot of time on their feet. Any work setting that combines hard floors with hours of endless standing can result in fatigue, pain and discomfort for the employees. Anti-fatigue mats help to reduce stress on the body, along with pain in feet, legs, back, neck, and shoulders. Our mats contain the highest quality materials to aid in circulation and prevent fatigue. The variety of designs and materials make these mats ideal for a broad range of work settings. Safety features like bevelled edges and non-slip surfaces also enhance safety for the employee and for customers in the area. Anti-fatigue mats implement supportive materials, which help to cushion the bottom of your feet. These mats are often made of rubber but they also come in vinyl, foam, and gel. The best design and material depends on where you will use them and the potential hazards in that area. They act like shock absorbers, taking the stress off of the body that usually occurs from standing on a hard floor. Hard floors also cause the spinal cord to compress, resulting in backaches. Our anti-fatigue mats can make a big difference in the health of employees but they also benefit employers. Employees who are in pain aren’t as productive or as friendly with their co-workers or the customers they serve. Standing still reduces circulation and actually makes the heart work harder. Our anti-fatigue mats increase circulation and make employees more productive. It’s a simple way to take care of employees and make them feel better about the job they do. Employees and employers benefit from using strategically-placed anti-fatigue mats in nearly any industry, including hospitals, restaurants, schools, and hotels. Anyone, from stay-at-home moms who spend a lot of time in the kitchen to factory workers who stand in one spot all day can benefit. Choosing the right mat for your specific needs depends on the setting and the size of the area that needs to be covered. The following overview of the different types of anti-fatigue mats we carry will help you decide. Foam – Foam mats are popular for home use and in work areas where employees rarely spend more than a few hours standing. Foam is the most common material used in mats designed to prevent fatigue and make standing for shorter periods of time more comfortable. Some features to look for in a foam mat include the amount of pressure (body weight) it can withstand, its size and thickness. Foam Rubber – These mats implement foam, which is then coated with rubber for greater strength and durability. Foam rubber anti-fatigue mats are frequently used in areas with a harsh working environment. 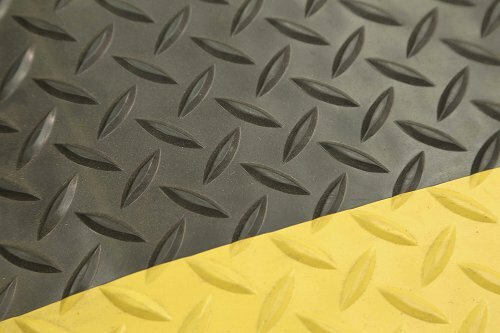 Hard Rubber – Hard rubber mats are the toughest and most durable of all the anti-fatigue mats we offer. Their resistance to abuse also makes them less effective at fighting fatigue. The hard rubber material is resistant to spills. They are easy to clean, unlike those mats made of other materials. Gel – Gel anti-fatigue mats work in much the same way that gel inserts in your shoes work. They consist of a strong exterior and a gel filling to provide the greatest level of fatigue prevention. In spite of the stronger material used on the exterior, gel mats are not the best choice for use in harsh environments. Our collection of anti-fatigue mats includes those manufactured for use in wet areas like kitchens, dry areas such as carpeted offices, and those with oil or chemicals and high temperatures. Choose the right mat for the space, the person, and the type of exposure it will face every day. We know the value that anti-fatigue mats bring to the employee and to the employer alike. We offer some of the best and most affordable anti-fatigue mats from Comfort Flow, Hog Heaven, Happy Feet, and more. We have everything you need to help your employees reduce fatigue and pain so they will be more productive for your business. See our full range of anti-fatigue mats here.